The spot height for both summits is 2861m. The 2644m ENE subpeak was climbed in 1901 by Arthur O Wheeler, in a survey party. Notes from old "unnamed" entry as follows: A small peak north east of Avalanche Peak that overlooks the gorge of Avalanche Creek. 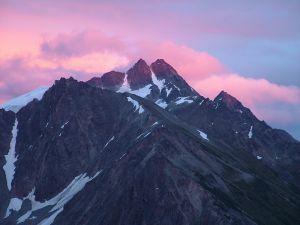 The only recorded route is the west ridge, a class 3 scramble accessed from the summit of Avalanche peak. The steep north face is apparently unclimbed.